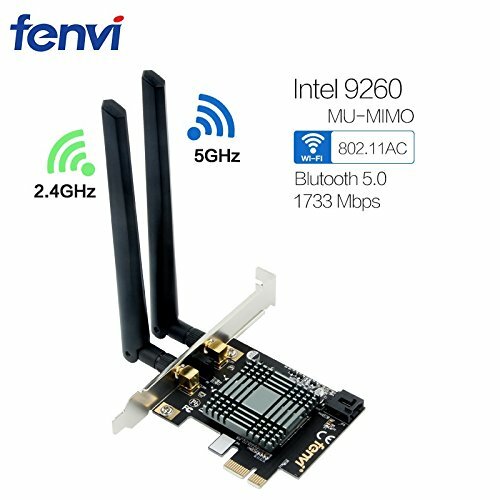 The Fenvi Wireless-AC 9260 adapter supports Bluetooth+ 5 and 2x2 802.11ac Wi-Fi including wave 2 features such as 160MHz channels, delivering up to 1.73Gbps and downlink MU-MIMO. These new features deliver a significant increase in user speeds in dense deployments, supporting fast downloads and long battery life compared to legacy 802.11ac devices. Combined with Core processors and exceptional wireless innovations, the Wireless-AC 9260 can provide Gigabit download speed and dramatically improve your connected experience at home, work, or on the go. Max Speed:1.73Gbps ,Note:The router support 1730Mbps,and can change to 160Mbps. If you have any questions about this product by Fenvi, contact us by completing and submitting the form below. If you are looking for a specif part number, please include it with your message.